I have worked with dozens of Aerospace and Defense contractors over the last two years in an effort to help them improve their security and compliance posture in the face of increasing government regulatory requirements, such as DFARS 252-204.7012. These organizations must defend against continual attempts to compromise their systems and gain access to the CUI / CDI / ITAR content that they maintain. As part of that experience, I have researched and documented many different platforms to help customers get the most from their implementations and achieve their goals with the most comprehensive and cost-effective technology possible. These platforms range from traditional on-premises architectures to the various cloud platforms like Office 365, Google G Suite, Microsoft Azure and Amazon Web Services. This is the first of three blogs which will breakdown common platforms and what they offer in terms of security and compliance features. Feel free to check out my previous blogs on building security and compliance solutions using Microsoft Office 365, Office 365 Government Community Cloud and Azure Gov. Typically, one of the first discussions I have with customers is about their current system or platform and what the process entails to become DFARS 252.204-7012 and NIST 800-171 compliant on that respective platform. A thorough evaluation often reveals surprising vulnerabilities, which typically leads to a change in platform and/or infrastructure. The second conversation is a discussion centered around contractual requirements (DFARS, NIST 800-171, CUI registry, handling sensitive data such as ITAR, etc.) and operational goals (ISO, collaboration across departments, securely sharing information with varying workforces). Below is a quick look at Google G Suite and how it tackles both of these conversations. Bottomline, Google’s G Suite is an affordable option for many businesses and offers many user-friendly benefits, but there are significant challenges for the Aerospace and Defense community. Let’s explore how it performs against the technical requirements of federal regulations such as DFARS, NIST 800-171, ITAR and the FAR. Google G Suite Software – Inexpensive and Cool but is it Secure? Google built the G Suite Software as a Service (SaaS) products to be a series of consumer oriented and standalone components. The result was several user-friendly services that individuals loved and kickstarted the first wave of cloud adoption. The popularity of the consumer products led Google to develop a business focused platform which competes with the Microsoft Office 365 suite. Unfortunately, the consumer roots of the products do show through when the requirements of handling Government CUI/ITAR data are levied against it. In the platform's favor, it is relatively inexpensive - especially at the entry level. Many small businesses bought into the least expensive version of G Suite and never moved because the day to day functionality that they needed was provided by the basic version of the platform. With the G Suite basic you receive email, voice and Video Conferencing, Web Based Office Productivity tools and 30GB of personal cloud storage. What you don’t get is any kind of significant security controls. Additionally, I have had numerous executives tell me that they want to stay on Google because it is a “different” or “cool” platform and provides them a differentiator from other Aerospace and Defense companies, giving them a culture bonus when competing for new hires. Younger employees and recent college graduates also tend to transition to the platform with additional ease during on-boarding because of past exposure to the products. There's no question that G Suite is the lowest priced option, but it has difficulty being technically acceptable. Let’s evaluate how G Suite meets security and compliance technical controls for your business with DFARS, NIST, ITAR and emerging FAR requirements. Government contracts commonly require compliance with Defense Federal Acquisition Regulation Supplement (DFARS) 252.204-7012. To summarize, DFARS specifically strives to protect 23 categories of CUI data by ensuring compliance with cloud computing standards (FedRAMP Moderate), security controls (NIST 800-171) and cyber incident reporting for CUI data associated with government contracts. Specifically, DFARS paragraphs C-G define the cyber incident reporting requirements, and Google G Suite Services cannot meet these requirements in their entirety. One of the biggest holes is the inability to properly report incidents to the government with detailed information including a forensic image of the breached system. 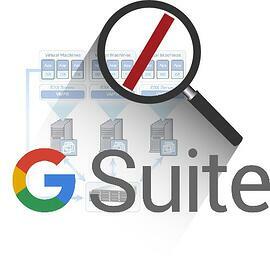 This means that Google customers with Defense and Aerospace contracts with the “7012 Clause” are in risky situation if they maintain CUI data using G Suite as they will not be able to respond to government requests for data in case of an incident. Not to be dramatic, but this is the biggest gap of all. Protecting Unclassified Information in Nonfederal Information Systems and Organizations, NIST SP 800-171 is the referenced regulation within DFARS that further defines data compliance requirements. NIST 800-171 is responsible for identifying appropriate information security controls, including minimum requirements for non-federal information systems holding CUI data. Google had an assessment completed by a Third Party Assessing Organization (3PAO) to determine their level of compliance and the assessor found the following 5 deviations from NIST 800-171. Not only do these gaps make it more difficult for contractors to achieve technical compliance on the platform, it also leaves several potential situations that could lead to the compromise of CUI data. . The fifth item is also one of your leading protectors against inadvertent release, as demonstrated in the graphic. 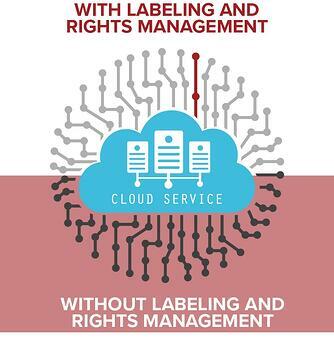 With proper marking/labeling and rights management, data is distributed where it needs to go and handled appropriately when it is received. While it is possible that Google addressed these holes with a compensating control, the appropriate compensating control is not addressed in the 3PAO report. Additionally, numerous other controls that Google is leveraging within their platform are dedicated to only a subset of the services within the platform. For example, Data Loss Prevention (DLP) is only available in Gmail and Drive. There is no DLP in Google Docs or any of the other solutions on the platform. I am not going to go through all of the services highlighting the deficiencies, but this is just an example of potential NIST 800-171 issues that you may run into. From customers I have talked to and other reports I am getting through the industry is that Google is attempting to work around the issues above by doing third party encryption on top of all data using an encryption gateway. This approach provides serious difficulties in management of data for customers holding CUI and Export Administration Regulations (EAR) content, and is not supported for ITAR data (explicitly). We get into the topic of ITAR next. One additional issue with this approach is that all access to the data for services such as Data Loss Prevention, Anti-Virus, Anti-Malware, Search, eDiscovery, etc, is lost (how they work in Microsoft O365). With an external encryption gateway, the SaaS services cannot access the data to perform any of these security and management functions. 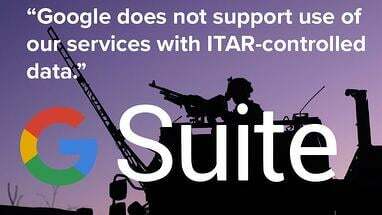 To understand why Google would recommend against putting ITAR content into their platform, you must understand a bit more about how their environment is built and staffed. First, Google doesn’t guarantee that information within their services will stay within the United States. They have data centers all over the world and depending on the services you are using, your data may be in any or all of these data centers at any point in time. The G Suite data centers are in Taiwan, Singapore, Ireland, Netherlands, Finland and Belgium. Secondly, given that they cannot guarantee data residency, they also cannot guarantee that all of the administrators and technicians for their services are US Persons and have been through the appropriate background checks required for access to CUI/ITAR data. They routinely hire non-US Persons for administering their platform and this is a significant problem for companies that have a requirement to maintain export-controlled information within their cloud service. Achieve full NIST 800-171 compliance for their cloud platform. Here are a few key items that make it quite risky for an Aerospace and Defense company to go Google. Risk of losing contracts in the 2019-2020 timeframe. The Missile Defense Agency recently underwent an audit that produced several findings and remediations that trended towards more strict enforcement of DFARS/NIST 800-171. Risk of losing subcontracts in the 2019-2020 timeframe. Not only is the Government heating up its enforcement of cyber security requirements, large prime contractors are now including black and white language about compliance with DFARS/NIST 800-171. Risk of losing contract competitions (RFPs). Contract authorities are beginning to change grading criteria to favor those contractors with air-tight technical controls and secure data management systems. Risk of being hacked, attacked, or worse. Just read this headline and article. It speaks for itself. "China hacked a Navy contractor and secured a trove of highly sensitive data on submarine warfare" Want to hedge bets on how much work that contractor receives from the Navy henceforth? Or any agency for that matter? Contractors must now treat data protection as a strategic and operational requirement to maintain or win business. Passivity is not appropriate or prudent on this front. We must evaluate the technical controls to determine if the current IT platform is sufficient or if a new platform provides the right strategic benefit.